The Short-haired bumblebee (Bombus subterraneus) is native to the UK and was once widespread across the south of England, occurring as far north as Humberside. Post-1950s its population distribution became isolated and patchy. Its decline was almost certainly the result of the loss of the species-rich grassland habitats on which it depends. It was last recorded near Dungeness in 1988 and was declared extinct in 2000. The Short-haired bumblebee reintroduction project aims to reintroduce this lost species to the UK, raise awareness of bumblebee and flower meadow declines, increase resident rare bumblebee populations, and recreate and give advice on managing and maintaining flower rich areas. 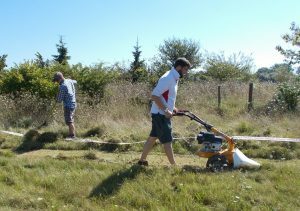 The project has been running since 2009 and is working with farmers, conservation groups, small holders and other land owners to create flower-rich habitat within the release area of Dungeness and Romney Marsh in Kent and East Sussex. Short-haired bumblebee queen. Photo credit: Nikki Gammans. In 2009 the Short-haired bumblebee partnership was formed between Natural England, the Bumblebee Conservation Trust, Hymettus and the RSPB. The partnership’s initial plan was to bring Short-haired bumblebees queens back to the UK from New Zealand (where the population are direct descendants of the now extinct UK population), however due to differing seasons attempts to captive-rear and export queens had limited success; results from genetic analysis also showed high levels of inbreeding, making the bees unsuitable for establishing a UK population. In 2011 the project partners agreed to change the reintroduction source location from New Zealand to a European source. After discussions with the Swedish Threatened Species Unit (STSU) about the status of the Short-haired bumblebee and advice from both Sweden’s national bumblebee expert and the local bumblebee recorder, the County of Skåne in southern Sweden was finally chosen as the source of the bees. We were advised that the population in southern Sweden was strong and expanding in numbers and that there are similarities in climate between southern Sweden and the reintroduction site of Kent and East Sussex. An initial visit to Sweden was made in May 2011 to find suitable locations to collect queen bumblebees. Working with the local bumblebee recorder, suitable areas of habitat were visited and queens were collected for disease screening. Natural England, undertook with Prof Mark Brown from Royal Holloway University of London and London ZSL, a full Disease Risk Assessment and Disease Management Plan in order to meet International Union for Conservation of Nature (IUCN) guidelines on species reintroductions. This required a protocol to be followed for reducing the risk of disease transmission. The Food and Environment Research Agency (FERA) approved the import of the bumblebees into the UK and the Natural England licensing unit granted a license to release them. In spring 2012, with continuing permissions and the co-operation of local and national bee experts in Sweden, up to 100 queen bees were collected from two linear-transects in Skåne, southern Sweden where good numbers of Short-haired bumblebees were found in 2011. The bumblebees were collected from two transects approximately 40 kilometres in length and a distance of 40 kilometres apart. Queens were collected with low intensity from along this 80 kilometre transect, meaning that there was minimal impact on the population at any one locality. Areas of Skåne which do not fall on these linear transects were not visited and samples were not collected. The bumblebees were then checked for mites and hive beetles by a registered vet and honeybee inspector in Sweden prior to a heath certificate being signed which allowed their transportation to the UK. After a period in quarantine at Royal Holloway, University of London, 50 healthy queens were released at RSPB Dungeness nature reserve. Five releases took place between 2012 and 2016 and a number of Short-haired bumblebee workers have been recorded, however we do not know enough about their genetic diversity to ascertain whether a viable self-sustainable population has established. Monitoring and genetic testing is therefore the focus of phase 2 of the project. Volunteers are key to the success of the Short-haired bumblebee reintroduction project. The key to a successful re-introduction of a species like this one, which is so completely dependent on its habitat, is of course the quality of those habitats. To date the project has created, advised and assisted in the management of over 1,300 hectares of flower rich habitat within the release area of Dungeness and Romney Marsh. In 2009 our aim was between 30-40 hectares. We are currently working with 75 farmers and 35 land owners who have been incredibly supportive of the project and its aims. The success of the habitat creation is being assessed through annual wild flower surveys and bumblebee transects to record bumblebee species and numbers seen. Excitingly the Ruderal bumblebee (Bombus ruderatus) has come back to the reserve after ten years and is dispersing into areas where it hasn’t been recorded for up to 40 years. 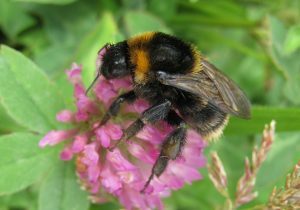 Other bumblebee species, such as Brown-banded carder bee (Bombus humilis) and Moss carder bee (Bombus muscorum) have also seen a resurgence and again are appearing in areas where they have not been recorded for 10-40 years. The Red-shanked carder bee (Bombus ruderarius) is also responding well to habitat improvements. The project has played a large part in raising awareness of bumblebee declines through events and publicity. We currently have 36 volunteers who help with these activities. We were also very proud in 2017 to be awarded runners up in the Countryfile Best Conservation Project Award for 2016. From 2017 the project will focus on establishing whether a Short-haired bumblebee population has established by completing genetic analysis of all Short-haired bumblebees found. After three years we will review the results and decide whether any further reintroductions are required. To increase flower rich diversity within the Romney Marsh and Dungeness area which spans from Hythe, Kent to the High Weald in East Sussex and north to Ashford. This will include a landscape scale ecology project to increase the amount of early (April-May), mid (June-July) and late (August-September) forage available for the rare bumblebee species found at the sites. Much of this habitat management is only possible with the help of our volunteers and the local land managers. To monitor Short-haired bumblebees and other rare bumblebee species through bumblebee blitz days, ad hoc surveys and BeeWalk transects. To raise public awareness about the importance of bumblebees and the project through outreach activities, such as community talks, stalls at the Kent County Show and South of England Show, guided bumblebee walks and bumblebee identification training days. In Phase 2 we will also be working with Kent Wildlife Trust on the three-year Fifth Continent Project which provides funding for a five month trainee to support the Short-haired bumblebee project in the east of Romney Marsh from April-September each year. The trainees will receive training in bumblebee and wild flower identification, habitat management, working with different farmers and land owners and public outreach. Our overall targets are to work with nine new landowners, establish five new bumblebee transects, recruit five new volunteers and undertake outreach events. Natural England, RSPB, Royal Entomological Society, IBRA, Roger de Haan Charitable Trust, Miss Betty Liebert, Hawthorn Trust, John Lewis and the many supporters who have donated through local fundraising activities. If you would like more information about this exciting project, please email nikki.gammans@bumblebeeconservation.org. Alternatively, you can follow the project on Twitter @nikkigammans or Facebook.